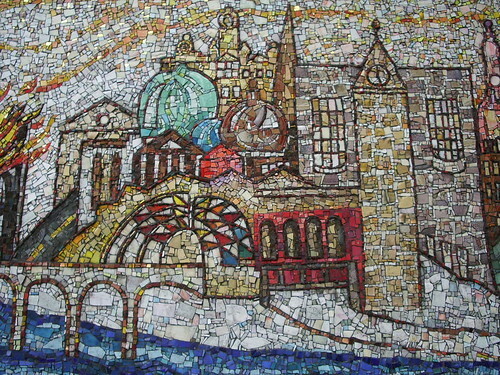 This is part of a much larger mosaic which is found at Glasgow’s Central Station. There were some good guesses yesterday – yes singing was definitely involved! What we learnt was a technique called waulking, which is a traditional part of the production process when making Harris tweed (a type of cloth from Harris in the Outer Hebrides islands). There is a good description of what waulking is here . 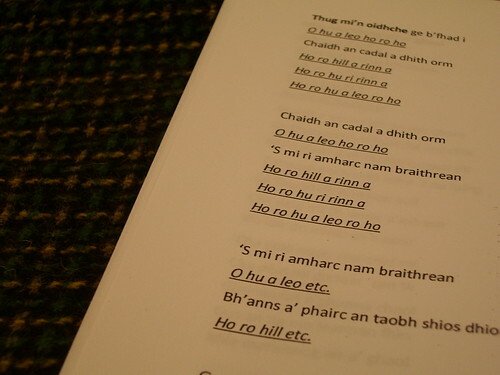 Basically it involves singing rhythmic Gaelic songs (the language was Gaelic, for those who weren’t sure) and pushing the material forward and along the table in order to shrink it and get the dye to set. If you read the link you will see they used to use a particular type of, er, natural chemical in this process – you’ll be glad to know we only used water! Celtic Connections (4) – Come and try …..? 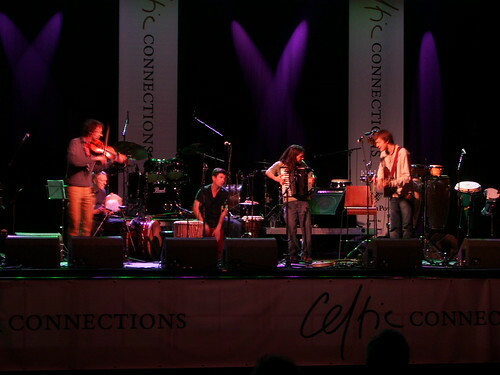 One thing that Celtic Connections do each year is a series of “Come and Try” workshops, where you can get together with other people and have a go at something new, for example they have sessions of Come&try stepdancing, accordion, fiddle, all sorts of things. 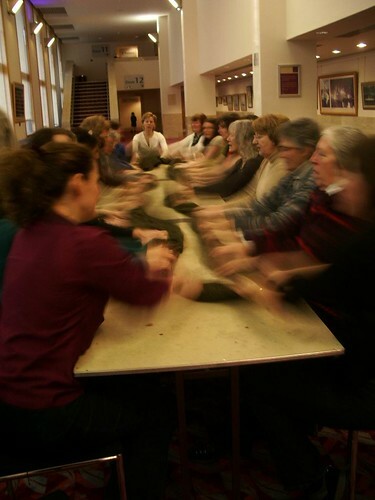 This is a photo taken at the Come and Try session we went to on Saturday – can you guess what we were doing? On Friday we went to see a band called Moishe’s Bagel (who play a hybrid of Jewish klezmer, Balkan, jazzy, trad sort of music) at the Classic Grand. Eagle-eyed Glaswegian readers will notice that this is in fact a picture not of the Classic Grand at all but of the Old Fruitmarket again (a great venue which will be the subject of a separate post sometime). I’m glad to say though that it really is a picture of Moishe’s Bagel – it’s just that because I was at the front and side of the stage at the Classic Grand most of the band were hidden behind the speakers, which obviously didn’t make ideal photography conditions, so instead I am posting this picture of the band from when they played at last year’s festival (where they supported a band called the Klezmatics – personally I thought Moishe’s Bagel were much better, and was really pleased to see that they had a headline gig this year). I like in this picture that you can see, particularly with the violin player, the energy and movement, it’s not a static image, and I was particularly pleased with it as I didn’t use a tripod or anything – just a 4-5 second exposure and a very deep breath as I leant over the balcony! 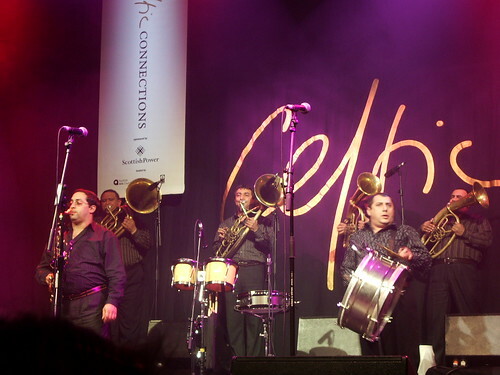 On Thursday we went to my must-not-miss-at-any-cost concert – to the Old Fruitmarket to see Romanian gypsy band Fanfara Ciocarlia. I saw them last year when I was living in Romania, and it was one of the best concerts I’d ever been to, so when I saw they were coming to Glasgow I was really happy! They didn’t disappoint – it was a brilliant concert. They were advertised here on the posters under the name “Fanfare Ciocarlia” which made me laugh – quite why people thought the English speakers would struggle with “Fanfara” so they anglicised it but then did nothing about “Ciocarlia” which is much more complicated seems a bit ridiculous to me! 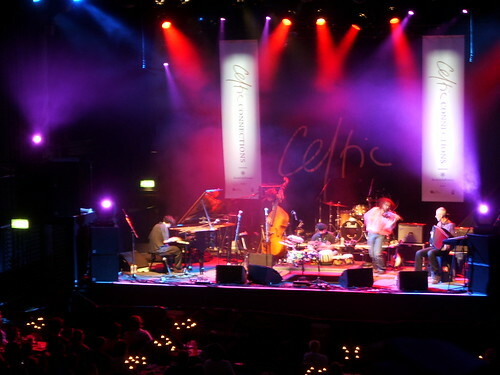 For me, one of the very very best things about living in Glasgow is the annual Celtic Connections music festival. For 3 weeks in January and February, we have the best Celtic and world music on our doorstep, with concerts in several different venues every night. I’ve been to a few concerts this week, and so for the next few days will share some of the best photos. 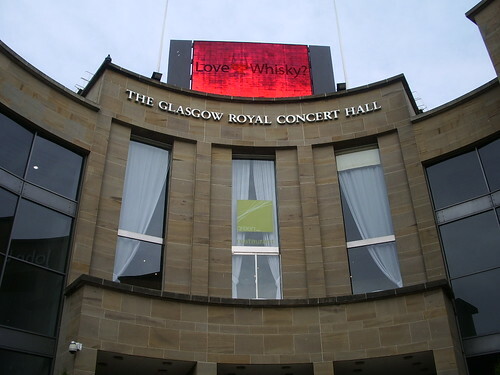 The Royal Concert Hall was built in 1990 (the year that Glasgow was European Capital of Culture), at the corner of Sauchiehall Street and Buchanan Street. There’s a great view from the top of the steps, looking down Buchanan Street (I showed you that view in November). I haven’t done anything fancy with the photo – the circular effect is exactly as the building is. It hosts around 400 concerts a year, plus corporate events – I’m off to a concert there tomorrow. 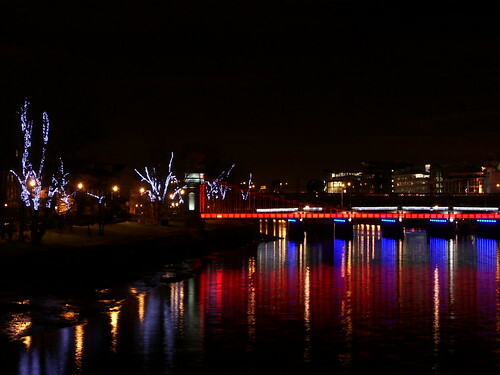 I showed a picture of this bridge lit up in red on the December 1 Bridges theme day. This is the view from the next bridge along (the other side of the bridge from where I took the last photo), looking west down the Clyde. When I first put this up on flickr, my contacts had a bit of a debate as to whether it needed cropping. One person felt there was too much black sky and it would be better cropped so it missed out most of the sky and the left hand side. But someone else thought that the reflected lights in the bottom left corner led the eye to the bridge, and so I should keep it as it is. I think I’m inclined to agree, but what do you think? 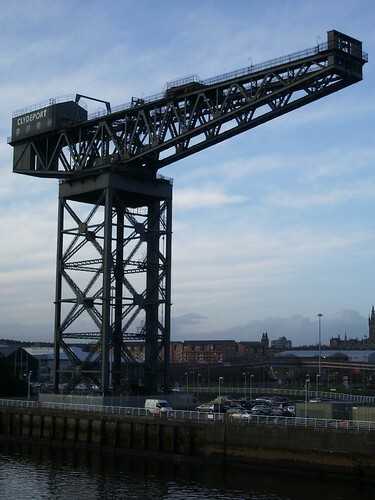 Just near the SECC (the Armadillo building I showed a couple of days ago) is this crane, officially known as the Stobcross Crane but popularly known as the Finnieston Crane due to its location near Finnieston Quay. It is now disused (since the early 1990s) – its main job was to lift boilers and engines onto new ships (the Clyde was formerly one of the main shipbuilding areas in the UK – the industry has now sadly declined and there are very few shipyards left). Now it is a Category A listed structure, and is a very potent symbol of Glasgow’s industrial and shipbuilding heritage. This picture, like the one of the SECC, was taken from the Squinty Bridge. 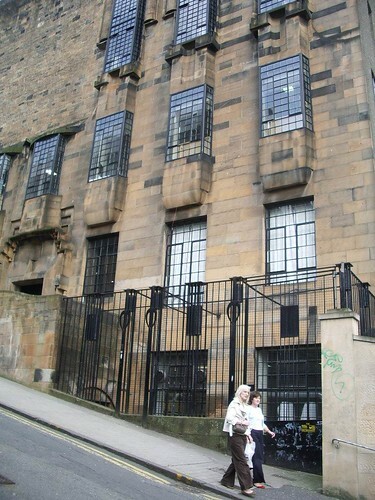 This side view is of the Glasgow School of Art, which was designed by one of Glasgow’s most famous sons, the architect and designer Charles Rennie Mackintosh. The design of the windows is very typical Mackintosh, whose work you can see round the city. Unfortunately you’re not allowed to take photos inside the school for copyright reasons, as it is still a working art school, which is a shame as it is very impressive inside. If you’re in the city it’s really worth booking yourself on a tour of the school – they are given by students and you can see all the typical Mackintosh designs. The library in particular is really something. In case you’re wondering by the way, yes the hill really is that steep!